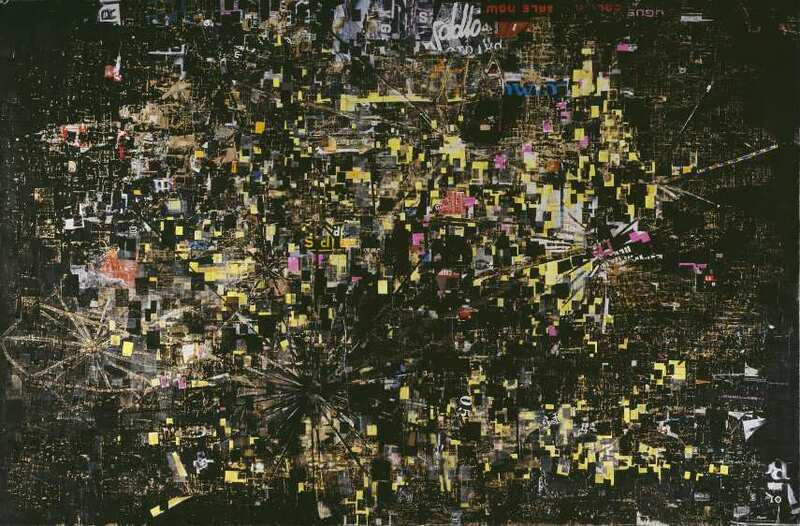 With a phenomenal ability to unite high art and popular culture through a variety of unorthodox methods, artist Mark Bradford has been blending his characteristic mixed-media collages and paintings with segments of billboards, flyers and stencils for over a decade now. Through a strongly abstract vocabulary, he made a routine out of simultaneously channeling his own identity and objective social observations through his artwork. In an ambitious attempt to somehow categorize his art as precisely as possible, we believe Bradford can be placed on a common ground of abstract and conceptual art as his work manages to reach the highest creative peaks of both these artistic methods without falling victim to any of the troublesome obstacles common to both conceptual art and abstraction. 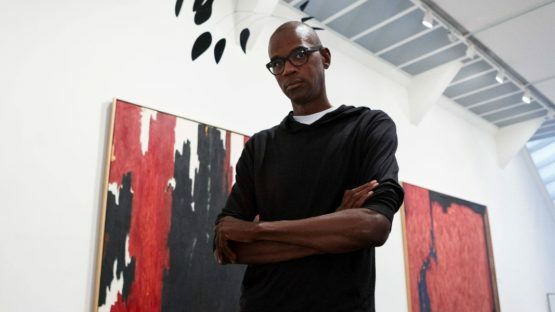 Mark Bradford is native to Los Angeles and was born in the southern parts of the city, but spent a large chunk of his childhood in Santa Monica after his family moved here when he was 11 years old. His mother Janice Banks owned a beauty salon in Leimert Park and Mark killed off most of his free toddler time at this location, helping his mom as much as he was able to. Even before Bradford graduated from high school, he was constantly showing glimpses of creative potential and this naturally reflected on all the artistic classes at his school. Despite being regularly praised for creativity, young Bradford never seemed confident and decisive enough when it came to his art. After he graduated and obtained his hairdresser’s license so he can have a sure job at his mother’s shop, Mark decided art was something worth pursuing a career in. However, it would take years for him to take the next collegiate step in that regard – he obtained his higher education at the California Institute of the Arts in Valencia, CA, a prestigious institution he enrolled at when he was at the age of 30! Mark received a BFA in 1995 and an MFA in 1997, passing both with flying colors. During these student years, it was remarkable to many that someone who was showing such extraordinary achievements whilst attending college actually spent his early years working at his mother’s hair salon. Logically enough, this particular setting reflected strongly upon his initial art as Mark’s earliest works were made with the use of permanent-wave endpapers, foil and dye. Nevertheless, these earliest pieces were already showing how much imagination and potential there was in Bradford and, luckily enough, now they were nothing but signs of greater things to come. Now he was on the right path, armed with all the collegiate knowledge at his disposal and ready to take the art world by storm. Ever since Bradford graduated, he became noticed for the characteristic grid-like abstract paintings in which he was frequently combining collage with standard paints. His art was semi-figurative at best at it was obvious from the get-go that the concepts behind the artworks were the primary elements of Mark’s interests. One of the pieces which can be used as a prime example of how Mark works is the famous Orbit (2007) – the painting contains a newspaper clipping of a basketball placed inside a thick structure of LA streets. 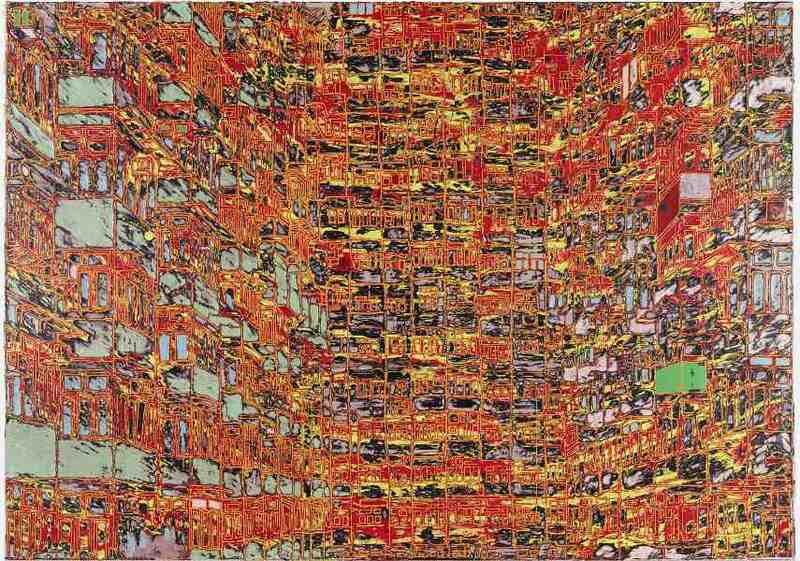 The piece was actually created by both using the collage and décollage techniques, relying on the cumulative and subtractive processes to deliver a dynamic depiction of a decaying city whose tiny, obscure street grids were no longer able to maintain its skeletal integrity. With this artwork, Bradford desired to raise awareness concerning the formidable problem of mass consumption and the piece became even more impressive as Mark revealed that it was essentially made on completely improvisational grounds. It also proved Mark was able to tackle any medium he deemed necessary in his artistic goals. Interestingly, Bradford’s ostensibly abstract paintings are not actual commentaries as much as examinations of specific conditions that shape communities. Another noticeable piece Bradford authored is titled A Truly Rich Man is One Whose Children Run into His Arms Even When His Hands Are Empty (2008) – it’s a 9 feet wide and 9 feet tall painting brimming with abstraction and yet again emphasizing the characteristic grid-like nature Mark was already renowned for. Maxwell Heller gave an excellent statement concerning the Rich Man: it calls to mind the charred and shattered windshields of cars burned in riots—black, webbed with streaks of light, sleek. If studied section by section, it offers traces of the artist’s sensual, tactile process, revealing delicate layers of found material sliced and sanded, lacquered and pasted until transformed. Interestingly, Bradford’s ostensibly abstract paintings are not actual commentaries as much as examinations of specific conditions that shape communities. Besides the aforementioned abstract paintings, Bradford’s practice also encompasses videos, prints and installations as he stands from nothing in order to reach the desired artistic goals. As a matter of fact, it seems as though he often emphasizes the importance of combining techniques and relishes chances to experiment with various methods. Among his installations, one that really stands out is the one titled Mithra (2008) – for this piece, Bradford shipped a huge ark constructed solely from salvaged plywood barricades all the way to New Orleans in order for it to participate in the happening commemorating Hurricane Katrina. This was actually the first of two installation pieces Mark launched that same year concerning the horrific events of Hurricane Katrina – the second piece known as SOS was situated on the rooftop of the Steve Turner Contemporary Gallery, right across the street from the Los Angeles County Museum of Art. When looked from above, the enormous installation said simply HELP US, giving the entire piece a strong shock value. More recently, Bradford worked on projects quite various in nature as he narrated the soundtrack to the site-specific dance duet Framework by choreographer Benjamin Millepied (2012), created a wall drawing inspired by Sol LeWitt (2015), authored the Waterwall piece composed of remnants of paper and rope (2015), etc. Numerous other projects were done in recent years as well, some larger in scale than others, but all extremely effective and narratively sharp despite the ambiguous form. Throughout his career, Mark Bradford has been known to cooperate with other artists on regular basis, combining his own works with the likes of Catherine Opie, Amy Sillman and Kara Walker. Amongst numerous awards Mark received for his artworks, what really stands out are the Nancy Graves Foundation Grant, the Louis Comfort Tiffany Foundation Award, the Bucksbaum Award and the MacArthur Fellowship. Bradford’s life story in many ways resembles a fairy tale – a man with immense hidden talent holds a trivial job for years untill the day he finally starts pursuing what he desires the most in this world, successfully overcoming all the obstacles placed before him and making his deepest dream come true. Currently, Mark is living the happily ever after segment of his fairy tale. And as he enjoys the happy ending, he tirelessly continues to create his energetic conceptual pieces, all immediately recognizable by the simultaneous chaos and order, coordination and impulsiveness, logic and confusion. 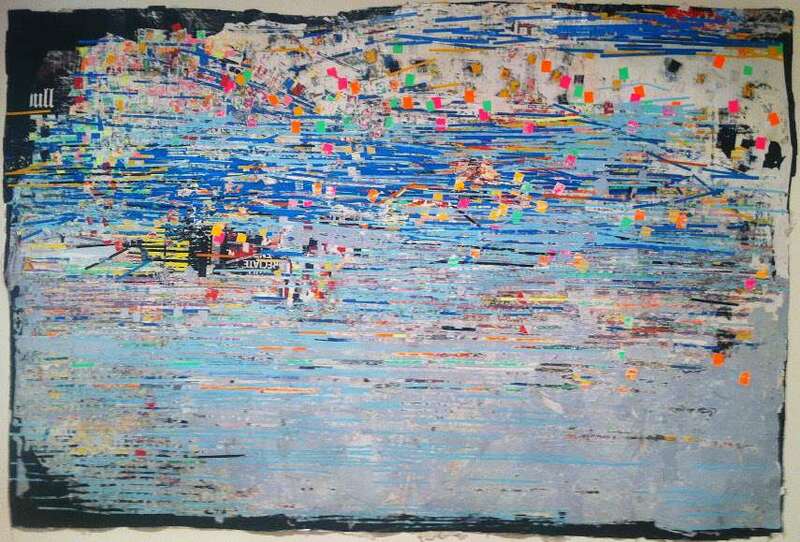 Such a peculiar style makes sure Mark Bradford still has a lot left in his tank to offer and we can surely look forward to more pieces from him in the future. This artist is represented by White Cube Bermondsey London, Hauser & Wirth Zürich and White Cube Mason’s Yard London. David Begbie lives and works in Edinburgh, Scotland.